These have been a long, long, long time in the making. 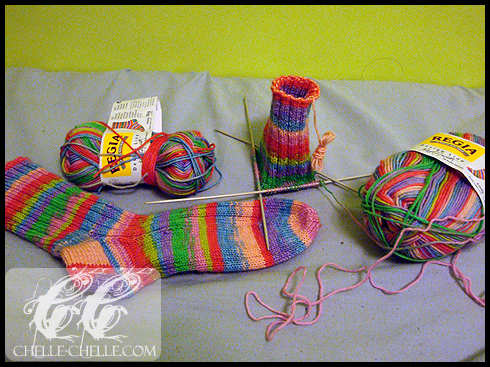 I completed the first sock fairly quickly but then spent forever on not doing the second sock. There’s a term for that: Second Sock Syndrome. I finished both socks back in the end of December, but just got around to posting about it now. These socks are knit from the Basic Ribbed Socks pattern by Kate Atherley. 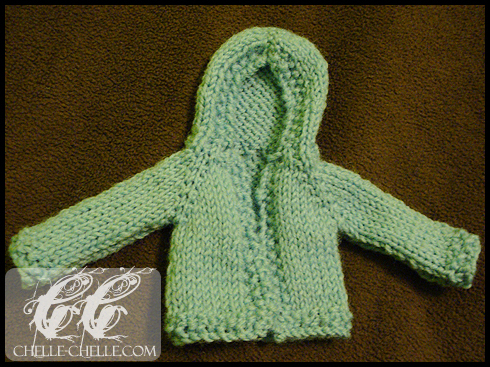 It is a free pattern that is available on Ravelry. I knit on 2.75mm (US 2) double pointed needles. I didn’t actually have a set of dpns in 2.75mm, but I did have several from thrift store baggies so I found 4 mismatched dpns in the right size. I used Regia’s Design Line by Kaffe Fassett in colourway 04450. I affectionately referred to the colour as ‘clown barf’ after I had knitted enough of the first sock to see how the colours were coming along. I had bought 2 balls of the yarn (460.0yds or 420.6m per 50g) and had, as you can see from the first photo, a lot left over. I used the excess amount of yarn for knitting other things (primarily doll clothing). These two sweaters are made from the same McCall’s pattern packet as the hooded cardigan from yesterday’s post. This one is Sweater B. The yarns used are primarily yarns from a Japanese store (in other words, I cannot read the labels very well). The yarn content is 80% acrylic, 20% mohair in both the blue, pink and grey. The white yarn was 70% acrylic and 30% wool. All are sock-weight yarns. 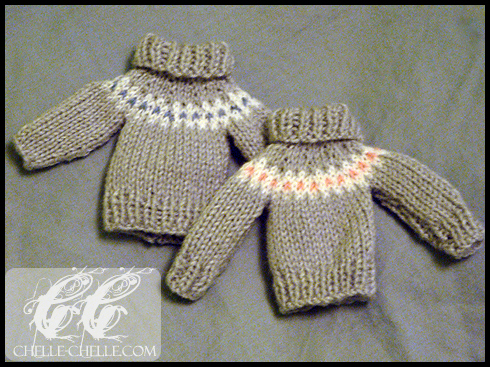 They were knit on 3mm (2½ US) needles. I’m still trying to catch up on posting photos of finished objects. Unfortunately, because of focusing on school work, there weren’t that many that I needed to get caught up on! I finished this hooded cardigan over two days. Dolly crafting is generally good for short-term projects and good for gratification. It’s not quite instant, but it’s pretty close. The yarn used was Patons Purple Heather in 0350. The ball band listed the date of manufacture as 26/11/1973. I got the yarn from my mom, it’s from when she used to knit. I knit it on 3mm (2½ US) needles. The pattern is from McCall’s 7841, Hooded Cardigan E.
The entire cardigan has a seed stitch border, which I find really helps ‘connect’ the entire piece together in making it seem a lot like a human-sized cardigan. One of my summer job coworkers was expecting to have a baby soon (a boy! the baby was born after I had left to go back to school). On my last day of work, I gave him a little something for his future offspring. I didn’t know what the baby’s name was going to be, or else I probably would have done something fancy (or attempted to). 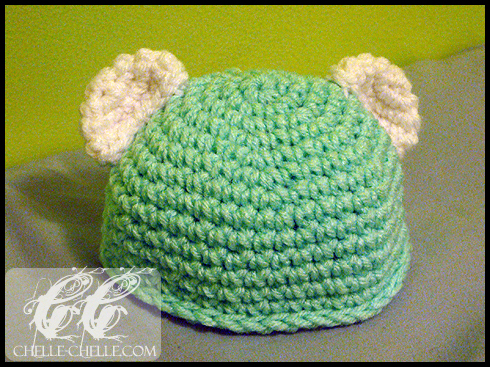 Instead, I made a little crochet hat. The hat was made in Bernat Super Saver in White (100% acrylic) and Red Heart Super Saver in Turquoise (100% acrylic). The hat was a simple pattern that I made up as I went along (increase of 6 stitches evening throughout until I got to the size that I wanted). The hat was 14″ in circumference, so I’m hoping that it fit as I didn’t get a chance to ask after the baby was born. 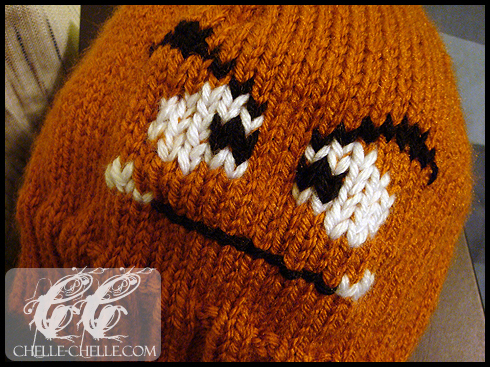 I’m hoping to get the pattern up soon, I just need to write it up and crochet another hat to test the pattern out before putting it up here.